Net Promoter Score – a widely adopted metric used to determine if customers are advocates of a business and is correlated to whether or not a company will experience financial growth in the future. Overall Satisfaction – a metric used to determine how well companies are meeting customers’ expectations and to evaluate how satisfied customers are with the current service they receive. Customer Effort Score – a metric used to determine how easy it is to do business with a company (ease of doing business is the strongest correlation with customer loyalty and customer satisfaction). As you can see, all of these metrics have been created over time to measure different things and it is important to choose the right types of metrics to get the right measure for your business. The above metrics will always have a place in customer experience research but they don’t necessarily always help when it comes to driving both strategic and operational action. Many of our clients come to B2B International with research briefs and tell us that their primary research objective is improving the customer experience that their customers are receiving. They also want a framework to measure this against over time and although the usual customer experience metrics get close, I don’t think they get close enough. Overall how satisfied are you with Company X on a scale of 1 to 10 where 1 is not at all satisfied and 10 is extremely satisfied? In the past 12 months, would you say that Company X has…improved a lot, improved a little, not changed, has got a little worse, has got a lot worse? By using the answers to these two questions, we can plot the answers to both questions on the Momentum Matrix framework. In working with the Momentum Matrix framework, we want to see as many customers as possible in the Continue quadrant and as few as possible in the other quadrants. We then take the proportion of customers in the Continue quadrant as the Momentum Score. So what is a great Momentum Score? Well you won’t be surprised when I tell you this very much depends on the type of business and the industry but what I can tell you is that a score of over 90% has been achieved by some of our clients who have fully integrated customer experience programmes within their business. However the best way to measure the Momentum Score is for a business to do this over time and an increase in the Momentum Score would conclude that a business has improved the customer experience it provides. The Momentum Matrix should also be used to drive action going forward and we recommend that our clients create different implementation plans depending on a customer’s positioning on the framework. It is also a good proxy in determining which customers you need to close the loop on most quickly and our recommendations on this urgency and the types of questions to be asked during these conversations are included in the below summary table. Act Now ✔ ✔ ✔ Why are customers not satisfied? Reassess ✔ ✔ What negative changes are customers noticing? Monitor ✔ What positive changes are customers seeing? Continue ✔ Why are customers highly satisfied? 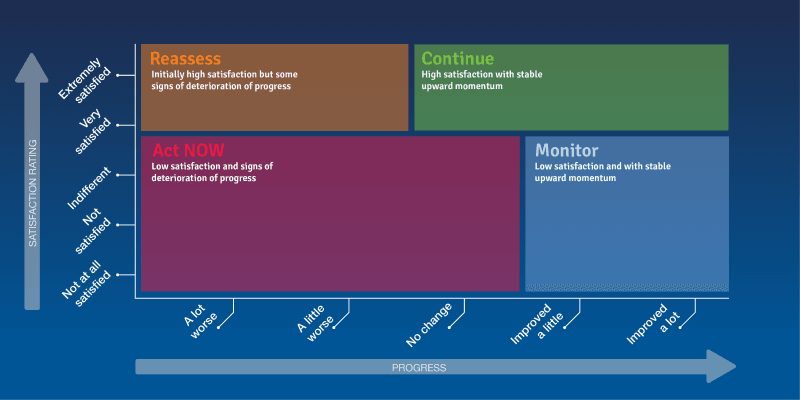 If you are considering starting or changing your customer experience programme and your primary objective is improving the customer experience for all then you should certainly think about using the Momentum Matrix framework. It can be used both strategically in the business to understanding how the company is currently positioned in terms of the experience it is providing to customers and operationally to close the loop with customers and help build individual implementation plans.